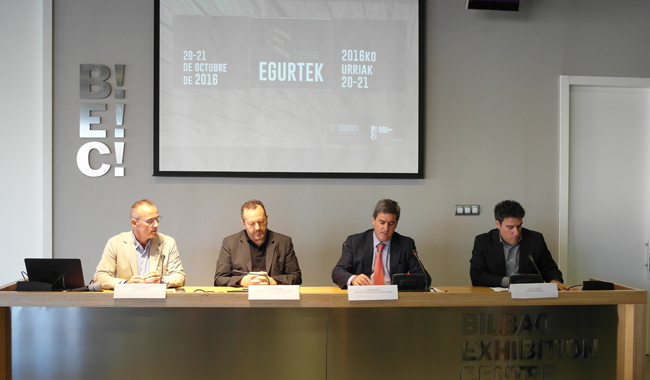 Experts and leading firms in the wood-working sector will gather at the Bilbao Exhibition Centre on 20-21 October for the 6th Egurtek International Forum on Architecture and Construction in Wood, organised with the cooperation of the Basque Government Department of Economic Development and Competitiveness. The main goals of the forum are to increase awareness of the use of wood as a sustainable material and report on its potential applications for strengthening business dealings. The associated congress programme and technical seminars will enable attendees to explore the many different demands placed on architecture today in terms of environmental, financial and social balance. The Congress will feature leading work by top architects and engineers from several countries, including Shigeru Ban from Japan, winner of the 2014 Pritzker Prize. Ban has gained international renown for his architectural solutions provided on an altruistic basis in response to humanitarian problems and for his innovative attitude towards structure and unconventional materials. Also taking part will be such distinguished specialists as Canada’s Michael Green, a defender of the need to use wood in the construction of large-scale buildings, the Finn Anssi Lassila, creator of Puukuokka, Finland’s first large wood-built apartment building, which stands 8 storeys high, Romania’s Tudor Radulescu, the designer of the wooden arch that covers the Church of the Discalced Carmelites in and the Austrian Juri Troy, who will be showing off his spectacular work known as the “House under the Oaks”. Domestic speakers will include Fernando Tabueca and Fermin Leache, winners of the Egurtek Prize for Building in 2014 for their work “Casa del Condestable”. Vitoria-born architect Gorka Elorza will also talk about his experiences. He is interested in eco-architecture, innovation and sustainability, rehabilitation and accessibility in his work, as exemplified by the detached family house that he designed in Guadalix de la Sierra in the province of Madrid. Finally, there are Catalan architect Jordi Fargas, who in 2011 designed a “passive house” form prefabricated wooden components for maximum construction speed and minimum energy consumption, and Mónica Rivera and Emiliano López, who seek specific answers to the circumstances of each project, with the emphasis on the everyday, discretion in their interventions, blending into the surroundings and clarity of construction. The technical seminars at Egurtek will be organised in three main blocks: “Sustainable Construction and Design” and “Woodland and Timber” on the Thursday and “Training” on the Friday. Under these headings, topics of major current interest will be covered, such as “The Construction of passivhaus buildings in the basque Country”, “Environmental Certificates”, “Bio-economics in Southern europe”, “Heat-shaped Materials: Further Possibilities for Cabinetmaking”, “The Influence of the World Market on Wood in Southern Europe” and “Research Projects in the Woodland of the basque Country” among others. The exhibition area at this year’s Egurtek has been expanded considerably. Over 50 firms will be showing off products and services concerned with construction in wood, including architectural studios, timber homes, wood treatments, sustainable construction, specialist journals and associations, engineering and decoration firms, wood for construction, structural software and importers of timber, components and materials. Austria and Canada will be playing prominent roles at Egurtek. The Austrian Trade Office in Spain has arranged for nine firms and organisations to take part, some of them with broad experience in our domestic market and others interested in breaking into the market through distributors and representatives. The Austrian timber industry exports 66% of its output, mainly to EU countries. The Basque Country/Canada Workshop is set to bring various organisations to the event from across the Atlantic. Canada is a world leader in the trade in forestry products. Specialists attending the forum can learn more about these companies, their operations and their goals at the Market Point, a new area where exhibitors will be giving brief commercial presentations. For the second time in a row, Egurtek is to host the Basque Country/Canada Workshop, which seeks to foster opportunities for cooperation in the field of innovative, sustainable forestry technology. The workshop is scheduled for Thursday 20, and has the support of the Basque Government Department of Economic Development and Competitiveness. Technology cooperation programmes with Canada under EUREKA and EUROSTARS, forest health, advanced services and products under the Basque Country’s strategic plan for wood and EU regulations on the sale of wood will be among the content analysed and discussed in the course of the morning. Representatives of firms and organisms from both countries, the Canadian Ambassador to Spain and the commercial attaché, the basque Govt. Deputy Minister for Agriculture, Fisheries and Food Policy, high-ranking personnel from the Canadian Council of Forest Ministers , NEIKER-Tecnalia, the CDTI Centre for Indusrtial & Technological Development, AEIM (the Spanish Timber Industry and Trade Assocaition), HAZI (the Association ofr Rural, Coastal and Foodstuffs Development) and EGOIN, among others, will be present at this high-profile institutional event with a view to sharing experiences and forging closer trade links. Egurtek is to recognise the best architecture and design work in wood in awards for Building, Design, Local Wood (Basque Quality) and Publications, in an award ceremony scheduled for Friday 21. This third edition of the awards includes a new category for efforts to disseminate the use of wood in construction through the graphic, print, audiovisual and digital media. In the Building category the award goes to the “Casa do medio” [“environmental home”] project for the rehabilitation of a single-family dwelling in Santiago de Compostela, carried out by Arrokabe Arquitectors. The Design category award goes to the “Valla peatonal Bilbao” [“Bilbao pedestrian fence”] project by the architectural and design firm Disaro. The winner in the Local Wood (Basque Quality) category is “Habilitación de Museo en el Astillero Ondartxo” [“Setting up of a Museum at the Ondartxo Shipyard”], while the Publications award goes to the journal Arquitectura y Madera, published by Esinal Ediciones, for its long history, continuity and quality. The members of the Awards Jury are acknowledged experts in the field of architecture, design, manufacturing and wood from organisations such as the Official Institute of Architects of the Basque Country & Navarre, the University of the Basque Country, Baskegur (The Basque Timber Association), the specialist communication group Infoedita, the Tabuenca y Leache architectural studio, the Bilbao-Bizkaia Design & Creativity Council and the Institute of Decorators and Designers of Bizkaia. Finally, Egurtek is also to host the presentation of the prizes for the fotoPARQUET photography contest organised by the National Association of Parquet Manufacturers (ANFP) to promote wooden flooring as the most environmentally friendly, healthy, cost-effective and long-lasting option. The Association has received more than 200 entries for the contest, from which a shortlist of 50 has been drawn up. It is from these that the jury will select the winners. The official opening of Egurtek on Thursday 20 at 09:30 will be chaired by Bittor Oroz, Basque Govt. Deputy Minister for Agriculture, Fisheries and food Policy.